Prove o seu caminho em torno de Las Vegas neste passeio gastronômico. 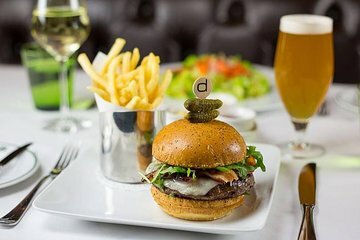 Um guia in-the-know leva você ao redor da famosa Las Vegas Strip para seis destinos gastronômicos diferentes. Desfrute de degustações de restaurantes chefs dirigidos por chefs com assento imediato e serviço VIP, tendo como pano de fundo os cassinos e as luzes de neon de Las Vegas. Entre degustações, entre no cenário gastronômico de Las Vegas e aprenda fatos divertidos sobre Sin City. Steve is a wealth of information and energy is contagious! Well thought and timed perfectly. Thank you so much! This was our first trip to Vegas and a great way to learn about the area and the restaurants. Our tour guide Steve was a wealth of knowledge. The tour was mainly between the Palazzo and the Venetian hotels. We tried many neat things, including my favourite Avacado egg rolls at Table 10 and learnt some great facts along the way. If you are new to Vegas and want to learn some history while trying some great food well worth the experience. This was a great tour. The guide was personable and knowledgeable. The food was filling and delicious. I have never been so full on a food tour. My fellow guests were fun to be with. One of the best tours I have been on. Definitely worth checking out. We went on this tour on our last day in Vegas. What a great way to end our stay. Our guide Steve Cuccio was relaxed and friendly and was knowledgeable without it been a lecture. Beautiful food at some great restaurants. Highly recommend this tour. Excellent tour. Lots of food. Our tour guide Steve was really knowledgeable about Las Vegas and the food scene. The foor tour is centered on teh Venetian and Palazzo. That's fine because there are like 70 restaurants. really nice tastings at a Table 10 and Buddy V's but the highlight was the pasta at the little Italian place on the Square. I highly recommend this tour. Well worth it. I hope they do one for the Ceasars/MGM properties or Wynn. Awesome. Fantastic food. Definitely found some highlights that I never knew existed. Great guide with lots of knowledge. Highly recommend it. Great selection of foods and good portions too. I have been on three food tours now between Chicago, Little Havana, and South Beach Miami. My GF had never been on one, and I thought this would be a good intro for her based on the food selections listed, and it was. Our tour guide was very knowledgeable and entertaining. Not only on the places we ate, but Vegas history in general. I am a huge history buff, and when you do not know the facts, it takes away from the experience for me. Our guide knew his stuff. We ended up on a 3 person tour, as the others cancelled or rescheduled, so it was a more personal experience which was nice for my GF and her enjoyment versus being in a big group. While this was more expensive than my other tours, you had some nice higher end food options we stopped along the way with the celebrity or well known chefs. I would recommend this tour to anyone who wants to enjoy some good food, and Vegas History along the way. I found the value for the money to be pretty good all things considered. We had such an enjoyable time! Our group was delightful. Hated for this to end. Great food and we learned much about Vegas and of course the restaurants and chefs. It would be difficult to choose a favorite stop. All were very good. We did enjoy Chicos. Tour guide Steve was fabulous and took the time to make everyone feel included. I would love to take other tours with Steve.